Have you ever seen a recording spy pen up close and personal? Perhaps you’ve only encountered them in movies but had no idea that there are actually real ones. Many people these days make use of spy pens for a lot of different reasons. It’s important to know how to use a spy camera pen if you intend to investigate something without being obvious. You should also research on the benefits that a pen hidden camera can provide so that you know if it’s really worth spending your money on. Click here to buy the Spy Cameras Reviewed approved spy pen on Amazon! What is a Spy Pen? You’ll be surprised to see that spy pens look and work like real pens. Most people cannot tell the difference. When you’re using a spy pen, it’ll never be obvious that you are! The only real difference is that it has a recording device inside of it. Most of them allow you to take pictures, video and some of them even have audio capabilities. The quality, features and length of recording time depends on the quality of the pen that you get. Some offer high resolution, a top-quality camera lens, video recording, motion detecting, and a long battery life. Others don’t really match up to these specs, but of course, the price is lower. Ready to learn how to use a spy pen? Keep on reading for the details for spy pen instructions, including charging and troubleshooting. 1. Press and hold the top button for up to 10 seconds or until the indicator light turns on. The light signals the pen’s readiness to record. 2. A short press on the button stops the recording. Usually, once the recording stops, the video automatically gets saved. 3. For some recording spy pens, there may be no light indicator but simply pushing the button already starts the recording. 4. You can download and check out the video footage on a computer. It may be deleted from the pen automatically, or you may have to do this in a separate step. 5. The battery life is not long for pen cams, so be sure to charge it after each use. Follow the manufacturers instructions for this, and you may also have to charge it before first use. ***Please note: these are some very basic spy pen instructions. Please follow the instructions in the included information with your spy pen. It will vary from manufacturer to manufacturer. 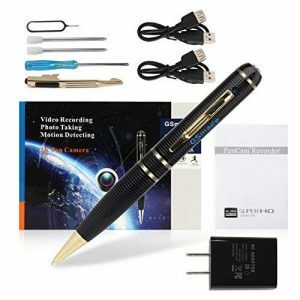 A spy pen recorder is an innovative invention used for taking pictures and recording video and audio clips discreetly. Because it’s very small and handy, it can easily be brought to different places by investigators. It is also used by civilians for a variety of purposes. The inner components of a spy pen are a miniature versions of those used in electronic gadgets. A tiny viewing lens is placed by manufacturers near the top of the pen case. There is also a microphone which allows you to record audio. How to Charge a Spy Pen Camera? A common question is how to charge a spy pen camera. We recommend checking the instructions for your specific model of spy pen because charging requirements vary. Some pens come to the consumer without a charge, so may require a lengthy first charge of 4-5 hours. On the other hand, some spy pens with cameras come fully charged and ready to go from the first second you get them. Most spy pens have an LED indicator light so you can see whether your pen is charging, or not. A steady, solid light usually indicates a full charge among many of the popular models. A blinking light is often a sign that the device is still charging. Of course, it varies between models and brands. There are various ways to charge a spy pen, depending on the model. Many of them have a USD cable that connects directly to your computer. Some have a USB adaptor, while others plug directly into the wall. In our experience, the ones with the direct USB connection are most convenient because you can transfer data, as well as charge the device at the same time. Pay close attention to overcharging (unplug the device as soon as you notice it’s fully charged). Do You Really Need a Spy Camera Pen? If you’re not working in the police force or connected with any private investigation institution, you may not actually need a spy camera pen. However, some ordinary people (like me and you) like to buy this as an interesting gift or just to have fun with it. Kids love to use them too! (Check out Spy Gear for Kids). It’s kind of tool toy for a Christmas or Birthday gift for that aspiring James Bond in your life. If you have an important interview coming up, why not consider using a spy pen camera. You can turn it on before going into the interview and leave it in your briefcase or messenger bag. That way, you can go back later and recall all the important details about the job description, salary, etc. that you may have missed during the initial go-around. Some people also use spy pens for recording events inconspicuously. For example, if you’re a secret shopper who needs to check and show how the establishment looks like as well as the products, what the employees are doing, etc. It’s often the case that a company (grocery stores) for example won’t want you to go around taking pictures of their prices and products. However, a spy pen camera allows you to do this a bit more discreetly than pulling out your camera or cellphone. A spy pen camera can also function like your regular cellphone camera. For example, when you need to memorize a particular number so you take a quick picture instead. Another use could be if your work colleagues, fellow students or teachers are harassing you. The spy pen camera will allow you to catch them in the act. Maybe you’re traveling, or have other reasons not to want carrying a big camera around all the time. Smartphones have cameras as well, but in some areas you don’t want to show your expensive smartphone. It’s also much easier to take the pen out of the pocket and take a picture instantly. Maybe you’re a student who wants to easily take pictures or record the classes. All of these things are possible with a spy pen. 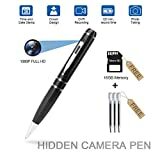 Are Spy Pen Cameras Easy to Use? It’s very easy to use a spy pen camera. It usually comes complete with instructions. There are sometimes YouTube videos for particular brand of pen with hidden camera as well. Usually, you just have to press a button to record a video or audio file or to snap an image. Some of these cameras even have motion-activated surveillance cameras. You can get them started by flicking them. Check out the individual product description to see what features each one has. What about Playback? Possible on the Pen Itself? A common question that we get is about playback. Can you do it on the pen itself, or does it need to be hooked up via USB cable to a computer. We’ve yet to find one that allows you to do playback on the pen itself. You’ll have to connect it up and download the footage to your computer. Another option for the pens with removable micro SD card is to remove it, and read it on whatever device will work with it. How Long Do Ordinary, Recording Spy Pens Last When Fully Charged? An average or ordinary spy pen usually lasts for up to 100 minutes when fully charged. Since it cannot last very long, you can just turn it off when not in use. It’s simple to switch them on and off without other people noticing. These days, there are some modern spy pens that claim to last for longer than this. You can verify this through feedback of previous buyers. We recommend reading the product reviews on Amazon very closely. Also, you can now opt to buy an extra battery to charge at home and replace the other one when it runs out of power. Can You Add a Memory Card to a Spy Pen Recorder? Most spy pens are not like spy glasses that can have a memory card slot. Usually, a spy pen recorder will simply have a specific number of pictures and length of video that are allowed within its capacity. However, now that memory cards have gotten much smaller, you can have a ton of recording time even in such a small package. Check out this hidden camera pen with a 32 GB memory card. It has enough capacity for just about any need that you might have within a single day or recording. Where Can I Purchase a Pen Spy Camera? Many people believe that carrying a spy pen with you wherever you go can come in handy. If you happen to chance upon an illegal act or something you would like to report, you can use the spy camera pen instead of your cellphone so as not to attract attention. What Should I Look for in the Best Spy Pen Cameras? Quality varies considerably, so it’s best to shop around to find the right one for your needs. You can find ones with audio, video recording (usually avi format), and photo capability (usually jpg format), but some don’t have all three. Read the product specifications carefully to know what you’re getting. Some come with a high resolution, 1080p camera lens that take crystal clear shots, others offer much lower-quality. Some come with automatic motion detection, and begin recording when this happens, offering hands free operation. Automatic stop or turn-off to save battery life. Rechargeable battery (lithium ion usually) life varies considerably. Some include a date and time stamp, but others don’t. Some include a micro SD card along with the pen. USB cable is not always included, check to make sure if you need one. Discreet recording lens that isn’t noticeable, even with closer inspection. Refillable ink, so you can continue to use your spy pen for years, instead of just until the ink runs out. Memory capacity (most are 8 GB, 16 GB, or 32 GB). Software that’s easy to get up and running (plug and play). Those are a lot of factors to consider when looking for the best spy pen. Do we have a recommended one? We’re glad that you asked! One of our favourites is the Fuvision Pen Cam Recorder. It has a 16 gb memory card, 3 ink refills, 2 hour battery life, and it’s essentially a portable DVR. It has crystal clear 1080p recording, all the touch of a button. It’s super easy to use, right out of the box with a Mac or PC. There’s a 30-day money-back guarantee and a 1 year warranty. Press the button on the top until the LED lights up. It’ll flash and then turn off. This means it’s recording. The light stays off so that people won’t know you’re recording them. When you press the button once quickly, the recording will stop. The light will turn on and it’s once again in standby mode. To turn it off, hold the button for a few seconds until the LED flashes a few times and stops. If you want to take photos, go into standby mode, and then double click the button. 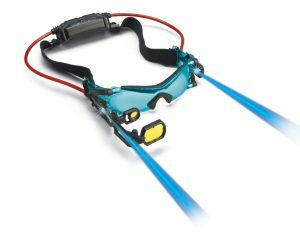 The LED will now be blue. Press the button once to take a picture. To go back into standby mode from photo mode, double-click again. Ensure that the spy pen is fully charged. It may seem obvious, but it’s worth a try. Switch from photo to video mode, or vice-versa. Erase and Reformat the spy pen. You can do this by clicking on the icon on your computer, and then choosing format, and quick format. Is it Legal to Record People with a Spy Pen? That’s a great question! You’ll have to check the laws for the location in which you live because they do vary considerably. Now that these kind of spy gadgets that used to used only by government organizations and spy agencies can be found in the hands of regular people, lawmakers are scrambling to catch up. Many states in the USA and countries around the world consider audio or video recording legal as long as one party knows about it. For example, you could record customers in your store without their consent. Or, record a conversation with your child’s teacher for example. When neither party knows, this is illegal wiretapping. On the other hand, some states (California, Connecticut, Florida, Illinois, Maryland, Massachusetts, Michigan, Montana, Nevada, New Hampshire, Pennsylvania, and Washington) and countries around the world require both parties to know. This is known as “two party consent.” Please be careful if you’re using a spy pen in one of these places. Above all, please keep in mind our #1 rule: Only for good, and not for evil. Spy Pen Camera: Have your Say! What’s your advice for using a spy pen cam? Do you have a favourite brand that you’d like to recommend? Leave a comment below and let us know your thoughts. Can they play recorded audio. On thier own. Does it have a playback? Usually you need to hook it up to your computer for the feedback.